Here is what you will have to do to prepare them in the true French Burgundy fashion. 1/8 tsp. cayenne pepper---not Tabasco sauce! Combine all ingredients except the bread and mix well with hands or electric mixer, then fold in the bread crumbs. Roll the butter into 2 individual logs or store in plastic containers. The Snails are drained from the can and rinsed with cold water. Place them in a non-reactive pot and cover with the ingredients listed below, bring to a boil, reduce the heat and simmer for 15 minutes. Cool in an ice bath, reserving the cooking liquid, ingredients and snails. Store in plastic containers until ready to use. Soften the butter and scoop the snails out of the liquid to drain. The procedure is almost the same for filling shells as it is for the cocotte. Place about 2 tsp. of butter in the shell, then a drained snail (the round part goes in first so the flat part is at the shell entrance) pushing it in slightly. Seal the shell with 2-3 tsp. of butter. Repeat this process until the snails and butter are all used. If using a cocotte, first add butter, then snail and top with more butter. Use about the same amount of butter with the cocotte as with the shells so you do not waste the butter. Heat your oven to 450, place the snails in the shell on specially made dishes to hold them upright (that is so the butter doesn't cook out of the shell). Or attractively crumple a sheet of aluminum foil into a 6 inch circle with 6 indentations to hold the snail shells upright. Cook for 10-12 minutes; when hot and bubbly, transfer to a serving plate and voila, they are ready to eat! In all methods use a baking pan as an under-liner to prevent the butter from spilling on the oven bottom and maybe causing a fire. 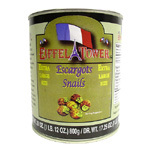 The finished dish should be served very hot, and sprinkled with a teaspoon of chopped chives for every 6 snails. Serve with warm baguettes to sop up the juices and butter.